...but they don't have to be. Using a high quality daily supplement can help avoid some of the most common canine conditions saving thousands on veterinarian bills and preventing unnecessary suffering for your family's best friend. Read more about why HardyPet Complete is the #1 choice of pet professionals for their dogs. THIS IS AN AUTOSHIP PRODUCT: Product returns are only available for first time orders for a particular product and do not apply to autoship orders. The HardyPet Autoship Program is a self-managed subscription service available to regular product users that need the convenience of regular shipping. Any changes to autoship orders must be made prior to the scheduled shipment date. Once an autoship order has processed it cannot be changed, cancelled or returned. Because the autoship program is fully automated and user-directed, a product discount and free shipping may be available. Acceptance of these promotional discounts implies acknowledgment that the autoship program is self managed and all order changes or cancellations must be made prior to the next scheduled ship date. Authorized changes can be made by logging into your account or by contacting our customer service team. Alfalfa Alfalfa is an excellent source of digestible soluble fiber and chlorophyll. Alfalfa has also been shown as a powerful antioxidant, antibacterial and antifungal compound which aids in digestion and boosts immune system function. Refined Oyster Shell Refined oyster Shell is a natural source of calcium and is needed for healthy bone development in puppies as well as proper bone maintenance for adult dogs. Canine diets low in calcium are typically a significant contributor to joint conditions in young dogs and debilitating bone loss in mature dogs. Pine Bark Pine Bark extract is a bioflavonoid- rich, powerful antioxidant used to fight free radicals and maintaining capillary health and supports a dog’s natural inflammation control systems. Pine bark also provides multi modal support for joints, soft tissues and liver function, which makes it a popular recommended ingredient among veterinarians. Papain Papain is taken from the fruit of the papaya tree and is used to relieve pain and swelling (inflammation) as well as fluid retention following trauma or surgery. It is used as a digestive aid and for treating parasitic worms, digestive issues, allergies, and in the treatment of certain cancers. This amazing enzyme has been popular as a meat tenderizer for centuries and today is recognized as a powerful holistic canine anti-inflammatory. Alpha Amylase Alpha Amylase is an essential enzyme that helps dogs convert carbohydrates to healthy sugars needed for energy. It also enhances the mechanisms needed for proper nutrient absorption and delivery to vital organs and systems. A-Amylase deficiencies in dogs can create a wide variety of direct and system specific conditions that can be difficult to identify and treat. Tyrosine One of the most common canine conditions is Hypothyroidism can be related to a deficiency of Tyrosine and Iodine. The thyroid gland requires the amino acid Tyrosine to stimulate production of hormones that help regulate numerous body functions. Supplementing Tyrosine ensures that the canine thyroid gland has the building blocks it needs to functions properly. Alanine A critical amino acid that plays a key role in proper muscle and live function. When a dog's muscles convert other amino acids for fuel, left over compounds called glutamates are generated and must be removed from the muscle. Alanine carries the harmful byproducts to be carried to the liver. These compounds are then converted to new energy or are filtered out by the liver. Alanine deficiencies are seen in cases of impaired liver function and related disorders. Valine Valine is an essential branched-chain amino acid (BCAA) and helps dogs properly absorb and utilize various proteins in their diet. Studies indicate that a developing puppy with a diet that is deficient in isoleucine tend to be 30% smaller in size and overall development than those who receive proper supplementation. Tryptophan Tryptophan is en essential amino acid that can cross the blood-brain barrier depending on how much free tryptophan is available in the body. Tryptophan is a precursor to serotonin, which has been shown to be deficient in aggressive dogs. Increasing dietary tryptophan through supplementation can increase the amount of serotonin in the brain, which has been shown to reduce aggression and improve recovery from stress in some animals. An essential amino acid that promotes normal growth by helping to maintain the proper protein balance in the body and is necessary for the formation of tooth enamel, and elastin and collagen. Threonine also supports cardiovascular, liver, central nervous, and immune system function. Methonine Methionine is an essential amino acid that helps with metabolism and breaks down fat. It can also help with chelation, which is the removal of heavy metals from the body to ensure that the liver, kidneys, and bladder remain healthy. Methionine is a principle supplier of sulfur to the body and helps prevent disorders of the hair, skin and nails. Recent studies show that deficiency of methionine may be associated with the development of age-related cataracts and that methionine supplementation may delay their development. Histidine Histidine is an amino acid that is used to develop and maintain healthy tissues in all parts of the body, particularly the myelin sheaths that coat nerve cells and ensure the transmission of messages from the brain to various parts of the body. This essential amino acid releases histamines from body stores, is associated with pain control, is associated with arthritis, and widens small blood vessels; thus aiding early digestion by stimulating stomach acid secretion. Glutamaic Acid Glutamic acid, also called glutamate, is an excitatory neurotransmitter that increases the firing of neurons in the central nervous system. In dogs, Glutamate has been shown as an effective treatment for a variety of canine ailments including digestive issues, nervous system deficiencies, and behavioral problems. Lysine An essential amino acid that is required for growth and bone development in puppies, assists in calcium absorption and maintaining the correct nitrogen balance in the body. It is also needed to produce antibodies, hormones, enzymes, collagen formation as well as repair of tissue. Deficiencies in lysine can cause appetite loss, fatigue, anemia and hair loss. Asparic Acid Aspartic acid is an amino acid known to promote a robust metabolism and is used to treat fatigue because of the crucial role it plays in generating cellular energy. Aspartic acid moves NADH molecules from the main body of the cell to its mitochondria, where it is used to generate adenosine triphosphate (ATP), the fuel that powers all cellular activity. Luecine Luecine is a branched-chain amino acid (BCAA) which studies have shown is necessary for proper nutrient absorption during digestions. Luecine is often prescribed for dogs with cancer because of cachexia, a condition which the body loses mass despite the heavy intake of calories. Daily doses of Luecine help dogs maintain a healthy body weight by maximizing nutrient intake from their food. Arginine Arginine is critically important to young and developing dogs to ensure propwer growth and overall development. Studies have shown that arginine supplementation has a dramatic effect on the healthy development of young dogs. It has also been shown that puppies require additional arginine in their diet to avoid abnormal urinary function and retain a proper nitrogen balance. Isoluecine isoleucine is a branched-chain amino acid (BCAA) which helps dogs properly absorb and utilize various proteins in their diet. Studies indicate that a developing puppy with a diet that is deficient in isoleucine tend to be 30% smaller in size and overall development than those who receive proper supplementation. L-Methionine L-Methinone is an amino acid that is important to several canine body functions. Typically prescribed to help lower the pH level for improved urinary tract health, it can also act as a powerful antioxidant and has been proven to counter histimine production. This is an important factor in countering a dog's natural allergic reaction to both external and ingested allergens. Cystine is a sulfur-containing amino acid that helps form healthy skin, hair, bones, and connective tissue. It is also required to make glutathione, one of the natural antioxidants that fight free-radical damage (glutathione detoxifies the liver). Cystine works closely with glutathione to remove toxins from the liver. In fact, cysteine is often used in emergency rooms to treat acetaminophen overdoses in dogs, which are known to cause liver damage. Phenylalaine An essential amino acid that has analgesic properties and promotes the natural production of endorphins. Often recommended by veterinarians as a natural alternative to anti-inflammatory medications for the treatment of arthritis pain and other chronic pain conditions. Glycine An amino acid that is essential in maintaining healthy central nervous and digestive systems. Glycine is used in the body to help construct normal DNA and RNA strands—the genetic material needed for proper cellular function and formation. It helps prevent the breakdown of muscle by boosting the body’s levels of creatine, a compound that helps build muscle mass. Without glycine dog bodies are not able to repair damaged tissues and heal themselves. Vitamin A (beta carotene) Beta Carotene is precursor to Vitamin A and plays a vital role in canine health. This powerful phytonutrient strengthens the immune system in adult dogs and encourages healthy immune system development in puppies and young adults. Studies have shown that Beta Carotene is important for healthy skin and hair coat, normal bone development, reproductive health, general eye health, and cancer prevention. Vitamin B1 (Thiamine) Thiamine works with the other B vitamins to change protein, carbohydrate, and fat to energy. It is especially vital for changing carbohydrates to energy. It is a key factor in the healthy functioning of all canine cells, especially the nerves. Vitamin B1 helps the body cells convert carbohydrates into energy. It is also essential for the functioning of the heart, muscles, and nervous system. Vitamin B5 (Pantothenic acid) Pantothenic acid is known as the anti-stress vitamin since it is involved in the production of adrenal hormones and antibodies produced by the body’s white blood cells. Like other vitamins, it assists with metabolism and helps in the conversation of fats, proteins, and carbohydrates into energy for the body. Vitamin B5 enhances stamina, and is involved in the production of neurotransmitters. Deficiencies of Vitamin B5 in dogs can cause fatigue, nausea and joint pain. Vitamin B6 (pyridoxine) Vitamin B6 is important for hormone regulation, a healthy immune system, proper functioning of red blood cells, glucose generation and activation of genes. B6 deficiencies in dogs can result in kidney stones, weight loss, muscle twitching, tooth decay, skin lesions, anemia and stunted growth. Vitamin B12 Vitamin B12, along with iron and folic acid, work to ensure that a dog's nervous system functions properly. It is also needed for normal cell growth. When your dog is deficient in vitamin B12, he/she may become sluggish. A lack of B12 can also lead to health problems such as anemia and eventually gastrointestinal disease. Vitamin D Vitamin D is stored in a dog's fatty tissues and the liver. It helps promote bone health and muscle and nerve control. It also helps regulate calcium in the kidneys and to keep the calcium level throughout your dog's entire body at a good level. Like humans, dogs have the ability to create Vitamin D from sun exposure. Dogs that are indoors most of the day may develop a deficiency of Vitamin D which can lead to bone disorders, sluggishness, and mobility problems. Vitamin K Vitamin K is used by the liver to produce clotting factors, chemical compounds used by the body to control bleeding and promotes healthy bone density. Dogs with liver or intestinal diseases have difficulty absorbing vitamin K and typically require daily supplementation. Vitamin K deficiencies in dogs can cause bleeding because of anticoagulation from ingested substances or conditions, and can affect bone proteins causing fractures and decreased bone density. Iron Iron is crucial to a dog's diet primarily for the health of red blood cells. Red blood cells deliver oxygenated blood throughout the body. Iron is also important for several enzymes in a dog's body. When the body is deficient in iron, red cells do not develop as they should. The lack of iron causes the cells that are produced by the bone marrow to be too small, and too low in oxygen-carrying features. Magnesium Magnesium has a number of important functions. It is necessary for the absorption and proper use of certain vitamins and minerals including Vitamin C, Vitamin E, calcium and phosphorus, sodium, and potassium. It is necessary for proper bone growth and is necessary for the functioning of many enzymes in the body, and production of protein. Copper The body needs copper for normal growth and health. Copper is needed to help body use iron. It is also important for nerve function, bone growth, and to help body use sugar. Copper is a component of or a cofactor for approximately 50 different enzymes. These enzymes need copper to function properly. Copper is an essential nutrient that plays a role in the production of hemoglobin, myelin, collagen, and melanin. Copper also works with vitamin C to help make a component of connective tissue known as elastin. 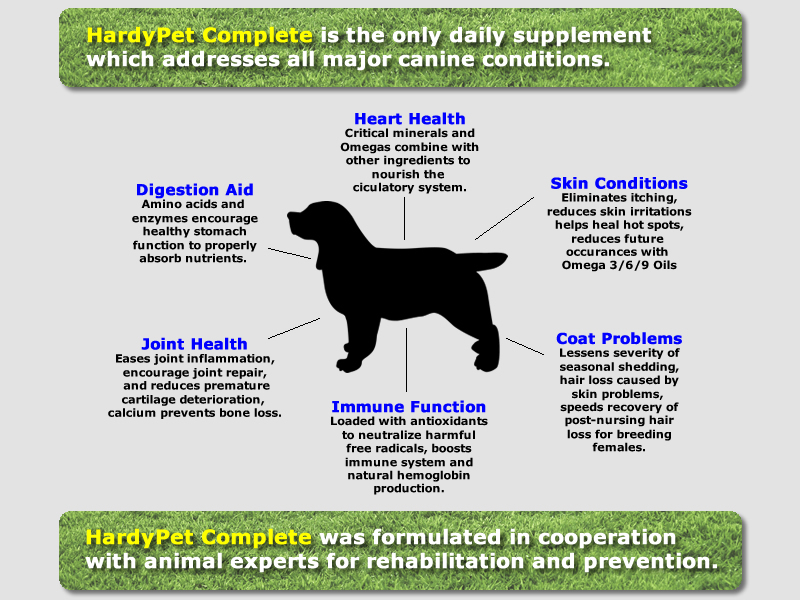 During an episode of a skin condition, joint related issues, or suppressed immune function, HardyPet Complete dosages may be doubled for up to three weeks. Q: is it a 3 month supply or do you give your dog 3 a day? A: Thank you for your question. The daily dosage will depend on the size of your dog. For those under 25 pounds, the recommended daily dosage is 1/2 wafer. Between 25 and 100 pounds, the recommended daily dosage is 1 wafer. For dogs over 100 pounds the recommended dosage is 2 wafers. We hope this information helps and please let us know if you have additional questions. Q: I have a 60# pit bull. What is the daily serving size ? A: The dosage range for HardyPet Formulas are: Under 25 pounds = 1/2 wafer per day; Between 25 and 100 pounds = 1 wafer per day, Over 100 pounds = 2 wafers per day. A: HardyPet understands that every dog has different taste preferences and there will always be a small percentage of dogs who may not find supplements palatable. Our testing has shown that this percentage is less than 5% of dogs, but it is important to know that owners are not stuck with a supplement their dogs will not eat. 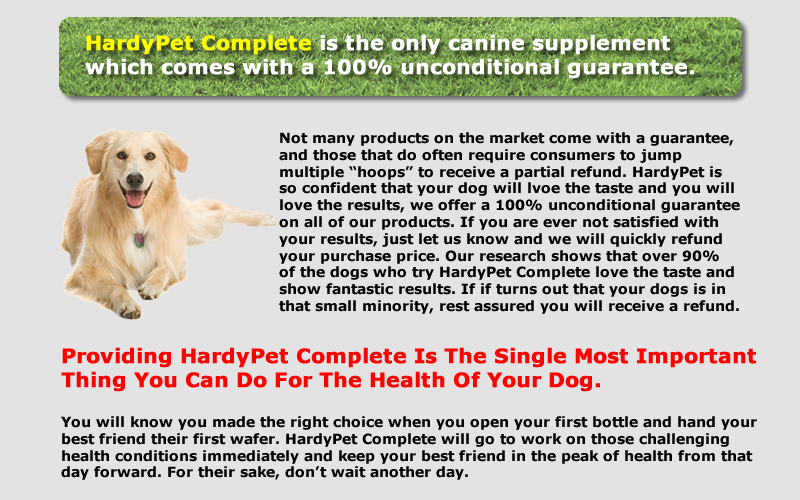 For this reason, HardyPet offers an unconditional guarantee for 30 days. Simply return the unused portion for a refund of the product price.